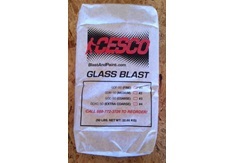 Glass Blast, crushed glass, has been introduced to the blast cleaning industry as a replacement for silica sand. Available grades in fine, medium, coarse and x-coarse. Please contact us today for available sizes and pricing. Get the latest news, upcoming events and specials. BLASTANDPAINT® is a registered trademark of CESCO®.